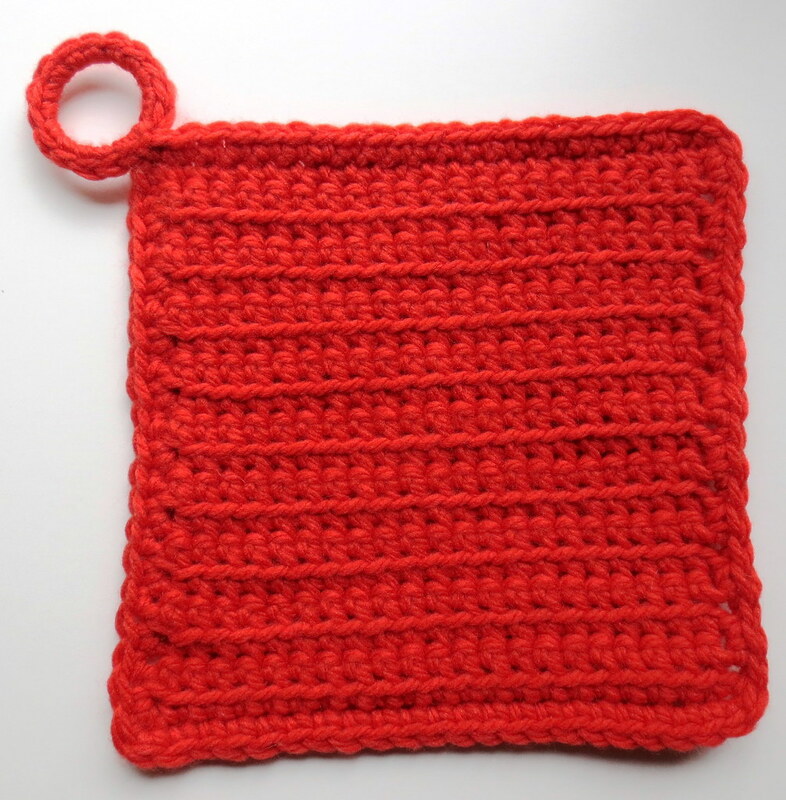 The square potholder was crocheted using my corded cloth pattern with a J (6 mm) crochet hook. Because this was a chunky yarn, I chained 23 stitches to start the hotpad and then single crocheted (Sc) in 2nd chain from hook and in each stitch across. Ch 1, turn. Sc in the front loop only (FLO) of each stitch across. Just repeat this row until 20 rows are completed. I then added one row of single crochet stitches around the entire potholder with 2 stitches in each corner. On the final corner I added a hanging loop by working SCs around the ring. I finished off the edging after the ring by joining with a slip stitch in the starting stitch. The hanging ring is a recycled plastic bottle ring from the twist off lid. The finished size of the square potholder is a 8 inch square. For the round potholder, I just start with a chain 4 and joined into a ring with a J crochet hook. I worked 10 double crochet (DC) into the ring and pulled it tight. I then worked increases of 2 DC in each stitch next round, 2 DC and then 1 DC in each stitch *repeat for next round, then next round 2 DC, 1 DC, 1 DC *repeat. Just keep going with measured increases on each round making sure you keep the hotpad laying flat and add an extra stitch as needed to keep it laying down nicely. I did 6 rounds in DC before adding a singe crochet round for edging. 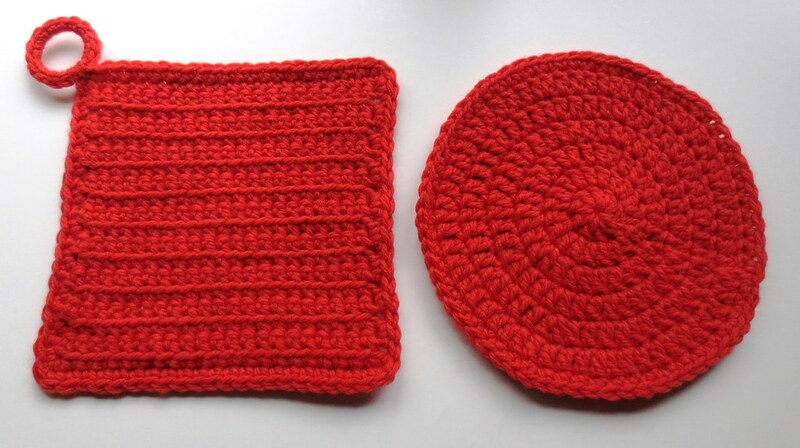 The round potholder is 8-1/2 inches wide. With Halloween just around the corner, I thought I’d share these pattern ideas for some fun potholders. Of course you can use any color of yarn or two strands of worst weight yarn to crochet your own hotpads using my pattern suggestions. Does it really absorb enough heat? Hot pots and pans can be a real trouble to handle without proper potholders. I have a rather thick kitchen glove that has lost its top layer on one end and has therefore been rendered unusable on that particular side. I quite like the fact you managed to salvage some old materials to create it. Its plausible and we should all take an example and start utilising seemingly to-be-tossed-as-garbage items into reused, refurbished, fresh creations. Keep up the good work, the potholder sure looks nice! @Christabel – These should be fine for hotpads for use at Halloween for our BBQ. I like having some lighter weight potholders to use for things that aren’t terribly hot but also like the real thick ones for things like dutch ovens and baking dishes. Thanks for stopping by and leaving your thoughts on recycled potholders and other repurposed materials. Simplicity sometimes works best! These would cheer up any kitchen and thanks for the idea of the plastic ring. I always struggle a bit getting my hanging loops straight and even. Must try it out! I like your potholder designs and like the way you make it. Wonderful posts posted! Really nice posts. Awesome effort!